Although record high gold prices are attracting warnings of bubbles, when compared with other gold bubbles, this bull run appears relatively mild. The 1979-1980 surge was still a significantly stronger run up and some think the same movement is possible today. See the following post from The Mess That Greenspan Made. 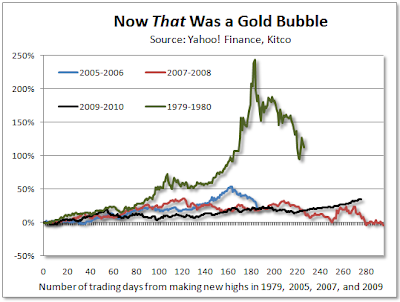 Amid the increasing talk of a “gold bubble” these days (and with many investors not likely caring too much that the “bubble” they now see isn’t all that impressive as compared to the “bubbles” they saw two years ago, four years ago, and six years ago as noted in this item earlier in the week), putting a real gold bubble from 1979-1980 up on the same chart with the more recent moves seemed like an interesting exercise. The result is shown below. Depending upon where you start the 1979-1980 move, it could be made to look even bigger. It is shown above, somewhat arbitrarily, beginning in May of 1979 at about $250 an ounce, though, one could argue that starting in the low $200 range earlier in the year or below $200 an ounce in 1978 would be more appropriate. For convenience, the chart above is also shown below without the green curve where the blue, red, and black lines look much more menacing with a 75 percent reduction in scale. 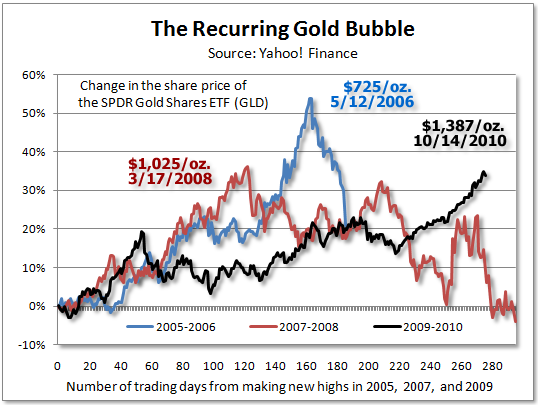 Clearly, the 2005-2006 move along with the surges in both 2007-2008 and 2009-2010 look quite different in the two charts and, when you think about it, you have to wonder: a) what the recent fuss is all about, and b) how much higher the gold price might go someday. It looks like the dollar strength we saw yesterday is quickly fading as more and more Federal Reserve officials talk about the urgent need to print more and more money. 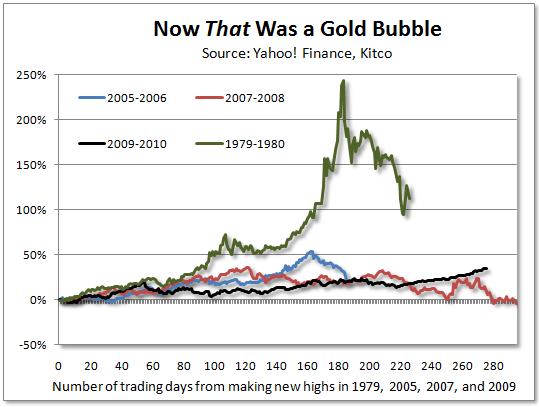 Don’t be surprised if, at some point, we again see something like the 1979-1980 surge – that would be an excellent time cash in and think about doing something different.